Visiting My Friendly Neighborhood Cardiologist! I went to my cardiologist at Makati Medical Center yesterday. Nope, I didn’t go there to ask about the side effects of PhenteRipped. 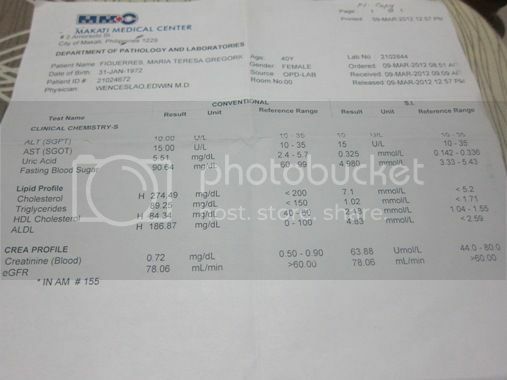 I went there to get the results of my clinical chemistry, lipid profile, and creatinine profile tests done last March. My bad! I know I should have gone to see my doctor for the results as soon as they were released, but it took me two months to see him because March is a busy month at work. I’m just really glad that my heart doctor is a cool guy who understands his patients. All of my blood test results are normal, except for my low-density lipoprotein (LDL) or bad cholesterol. Well, my high-density lipoprotein (HDL) or good cholesterol is high, but that’s good, according to my doctor. Because my LDL is high, I would have to start taking medication for hypercholesterolemia starting yesterday, which would last for two months. According to my cardiologist, I might have “familial hypercholesterolemia,” meaning the disease runs in my family. Well, both my parents are taking cholesterol-lowering drugs. He adds that even if I’m careful with what I eat, if it’s in our genes, then I’m likely to suffer from this disease. I’ll have another round of blood tests done in August, and I hope by then, my LDL level will be back to normal. This entry was posted in Cardiologist, Clinical Chemistry, CREA profile, HDL, Hypercholesterolemia, LDL, Lipid Profile, Makati Medical Center. Bookmark the permalink.